Pebbles were added t< Corrales wetlands to help with drainage. When you wash your hands or flush the toilet, do you think about where the wastewater goes? In most places, it eventually ends up being processed in a traditional sewage-treatment facility. But some places are experimenting with a new method that processes wastewater by creating wetlands. Wetlands are home to filtering plants, such as cattails, and sewage-eating bacteria. In 1996, school officials at the Corrales Elementary School in Albuquerque, New Mexico, faced a big problem. The old wastewater-treat-ment system had failed. Replacing it was going to cost a lot of money. Instead of constructing a new sewage-treatment plant, school officials decided to create a natural wetlands system. The wetlands system could do the job less expensively, while protecting the environment. Today, this wetlands efficiently converts polluted water into cleaner water that's good for the environment. U.S. government officials are monitoring this alternative sewage-treatment system to see if it is successful. So far, so good! Wetlands filter water through the actions of the plants and microorganisms that live there. When plants absorb water into their roots, some also take up pollutants. The plants convert the pollutants to forms that are not dangerous. At the same time, bacteria and other microorganisms are filtering water as they feed. Water moves slowly through wetlands, so the organisms have plenty of time to do their work. Wetlands built by people to filter small amounts of pollutants are called "constructed wetlands'! In many places, constructed wetlands are better at cleaning wastewater than sewers or septic systems. Visit and Observe Visit a wetlands and create a field journal of your observations. Draw the plants and animals you see. Use a field guide to help identify the wildlife. If you don't live near a wetlands, use resources to research wetlands environments. 1. Ecological succession is the gradual change from one plant community to another. 2. Primary succession begins in a place where no plants were before. 3. Secondary succession begins in a place that has soil and was once the home of living organisms. 4. 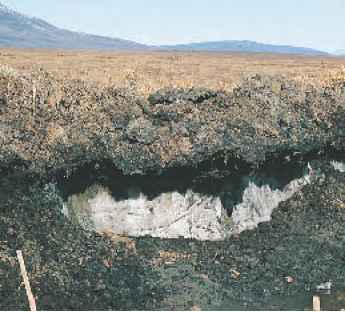 A climax community has reached a stable stage of ecological succession. 1. Temperature and precipitation help determine the climate of a region. 2. Large geographic areas with similar climax communities are called biomes. 3. Earth's land biomes include tundra, taiga, temperate deciduous forest, temperate rain forest, tropical rain forest, grassland, and desert. 1. Freshwater ecosystems include streams, rivers, lakes, ponds, and wetlands. 2. Wetlands are areas that are covered with water most of the year. They are found in regions that lie between land-masses and water. 3. Saltwater ecosystems include estuaries, seashores, coral reefs, a few inland lakes, and the deep ocean. 4. Estuaries are fertile transitional zones between freshwater and saltwater environments. 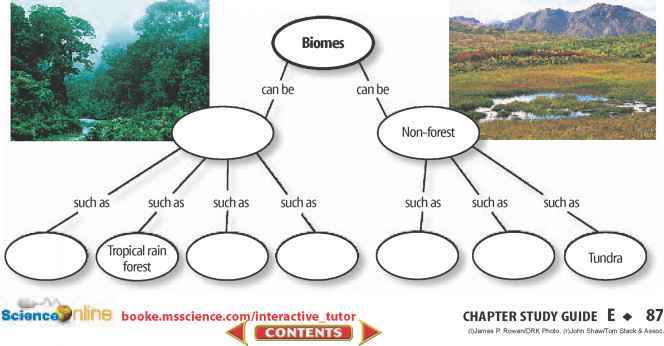 Copy and complete this concept map about land biomes.